Brian Needham – MacMillan Allotment. 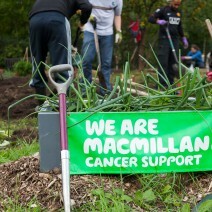 Brian starting attending the MacMillan allotment about a year ago. He had returned to the UK from a life in Spain because of serious ill health. Brian had been diagnosed with bowel cancer and had undergone extensive surgery in Spain but was struggling to recover and continue his working life abroad. On his return to Wythenshawe, Brian acted on the advice of the Macmillan Team based at Wythenshawe hospital to get more exercise and suggested he give the MacMillan allotment a try. “Real Food Wythenshawe has also provided extra opportunities for growing: an amazing poly tunnel, and plant sharing with other growing groups. I’m helping tend the young plants up at Wythenshawe Horticultural Centre on days when I’m not at the allotment”.